Short-term residents, and then …..
We are now opposite the Queen’s Head Inn, at 23 Bath Street. Then came the slope, a road leading up to Samuel Fletcher’s house and factory. Fletcher’s factory, which stood on the site now occupied by the Wesleyan Church and School in Bath Street, was a very old building. House and Factory were incorporated under the same roof. Samuel Fletcher senior, lace manufacturer and framesmith of Bath Street, married Ann (nee Stockley) in February 1814. Adeline was only two years old when Samuel senior died. In January 1857 he was returning by train from Nottingham but fell asleep during his journey, missed his stop at Ilkeston and ended up at Langley Mill. Initially the station master there demanded that Samuel pay the full fare from Nottingham but when Samuel produced his Nottingham to Ilkeston ticket he was asked only for the excess fare to Langley Mill. Samuel was indignant and refused to pay whereupon he was locked in the booking office with the station master while the latter completed his duties. Eventually the two of them were about to set off to see Robert Noon of the Shipley Boat Inn who might vouch for the framesmith when Samuel fell and suffered a compound fracture to his right leg. After treatment by a local surgeon he was returned home where he was placed under the care of Dr. George Blake Norman. However a week later he was dead, ‘mortification’ having taken place. Three brothers were in business together …..
Joseph retired and lived by himself in a house built by himself next door below William Wade, the grocer. The eldest of the three Fletcher sons mentioned by Adeline was Joseph who was born in Nottingham in 1816 and who married Ann Hawley, daughter of John and Mary (nee Burgin-Richardson) of South Street in May 1842. Joseph had not any children. Joseph Fletcher’s marriage to Ann was followed by the birth of at least six children before Ann died in May 1851, aged 32, from complications shortly after the birth of daughter Ann and while the family was living in South Street. Joseph appears to have moved into his Bath Street house close by William Wade in the 1850’s and the 1861 census shows him there but not alone. He is now with his second wife Sarah (nee Hardstaff) whom he had married in January 1860, and daughters, Sarah Ann and Hannah from his first marriage. Sarah Hardstaff was the eldest child of joiner William and Phoebe (nee Hooley) of Arnold, Nottingham. At this Bath Street address – number 82 — Joseph retired and here also Sarah died, in November 1887, aged 75. Almost exactly two years later Joseph married his third wife Sarah (nee Meads) the widow of Nottingham beerhouse keeper John Holmes and then moved to Beeston and eventually to Nottingham. Joseph died at 125 Noel Street in Hyson Green, Nottingham on March 1st 1901 but was returned to Ilkeston to be buried in St. Mary’s graveyard with his second wife. Before his first marriage Joseph may have fathered an illegitimate son with Sarah Cockayne, daughter of William and Mary (nee Chambers). Born in December 1838 the boy — Joseph Fletcher Cockayne — lived at the Common and later at Trumpet Yard, Cotmanhay, with his mother who in February 1850 had a second illegitimate child, Mary Ann. In March 1868 Joseph Fletcher Cockayne married Mary Richards, the daughter of Cotmanhay coalminer Joseph and Sarah (nee Booth) and for the rest of his life lived in the Cotmanhay area, dying in April 1909 at 3 Ash Street. Both at his baptism and at his wedding, lacemaker Joseph Fletcher was declared as his father. Still unmarried, his mother Sarah died in March 1889, aged 68!! (Her baptism record indicates that she was born in July 1815). Sarah’s illegitimate daughter Mary Ann gave birth to her own illegitimate daughter Elizabeth Ann Cockayne in April 1872. In February 1873 Mary Ann married Eastwood-born coalminer Joseph Meakin – and settled down for a time in Trumpet Yard. Matthew left the business and became the first landlord of the new Havelock Inn in Stanton Road. We have met Matthew in Stanton Road. Samuel (junior) was left to carry on the business. He made fine hair nets for H. Carrier & Sons. Born in 1828 at Ilkeston, Samuel Fletcher junior was the youngest son and in October 1850 married Judith Beardsley, daughter of Kirk Hallam labourer Thomas and Alice (nee Phipps). Sam had three daughters and two or three sons. Their first three children were daughters Alice, Eliza and Amelia. Their remaining six children were sons. 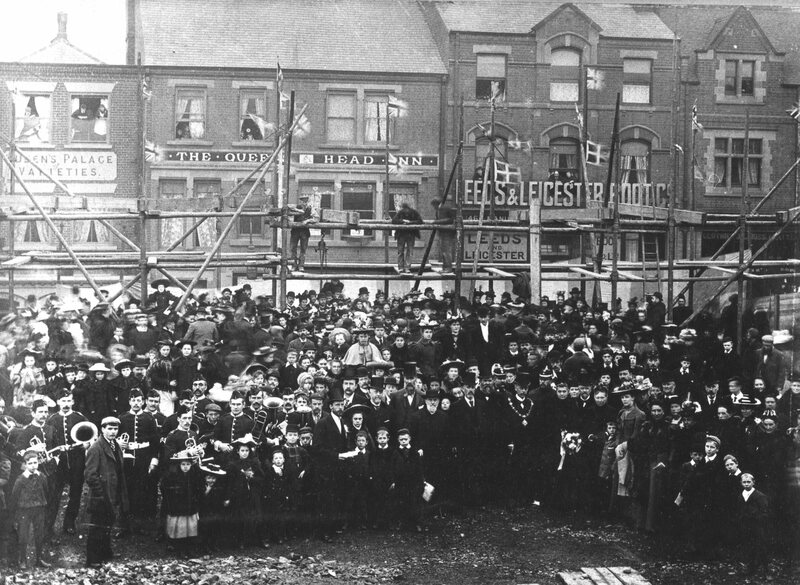 The Fletcher business moved from Bath Street to Wood Street in 1872 and the new Wesleyan Chapel was then built on the site of their old factory. Judith Fletcher died in October 1890, aged 64, at her Chaucer Street home. Husband Samuel died almost two years later, aged 60. They are buried together at Kirk Hallam parish church where their grave can be found, in the plot to the right as you walk through the entrance gate. (Samuel) was also an inveterate poacher, not because he could not maintain his family, but solely for the sport. He was caught once and hauled before John Radford Esq., Magistrate at Derby. The poaching fraternity called him ‘Jackie Radford’. When Sam was asked why he had been poaching, he said he did it for a lark. Jackie said we have a cage for larks, and so Sam was caged. Magistrate Jackie Radford of Smalley Hall died on March 29th 1866, aged 87, and was buried at Smalley Parish Church. He had been a county magistrate since 1828. Adeline does not mention brother Robert Fletcher, born in Newthorpe in 1820. In February 1850 he married Mary Ann Pounder, daughter of Shipley labourer Samuel and Dinah (nee Levers) and sister to Samuel junior, the ‘Surveyor, Inspector of Nuisances and Collector of Rates’ for the Ilkeston Local Board. Robert worked as a warp hand, lived the later years of his life at 18 Wheatley’s Row, off Pimlico, and died there in February 1874. Caroline died in Ilkeston in 1826, aged 2, and Edwin in 1827, aged 1. Eldest son was John, born in Nottingham in 1814. His sisters were Mary, born in 1822 and Ann in 1828. And now back to the ‘Old Wesleyans‘ whom we left in Market Street. 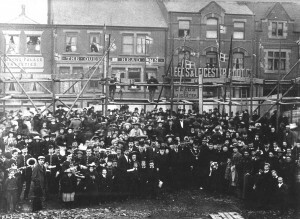 When the Wesleyan Church in Bath Street was built, — on the site of the Fletcher factory — the Methodist New Connexion took the small chapel in Market Street. It was in November 1873 that the Market Street chapel changed hands for £280 — the Methodist New Connexion purchased it from the ‘Old Wesleyans’. What were the events that led up to this chapel changeover? In the early 1870’s the ‘Old Wesleyans’ were finding the accommodation at their Market Street chapel very restricting especially for their Sunday School. Another disadvantage was that it was situated away from the centre of town, and thus an inconvenience for the congregation. And so, less than 20 years after moving there, they began to plan for an alternative venue. Initially a plot of land was purchased in Station Road but was thought to be no better a chapel site than their present Market Street home. Subsequently, in the summer of 1872, the lace factory and land of the Fletcher family in Bath Street came onto the market and was purchased ‘by the Wesleyans of Mr. Richard Evans’ — for £495 — who enfranchised the property and conveyed it as freehold. On March 4th 1873 a procession of the Church’s ministers, office-bearers and Sunday-school children marched from the Market Street chapel to the site of the proposed new Bath Street Church. There two memorial stones were laid, either side of the main entrance, under one of which a lead casket was buried. It contained a parchment recording the date, the names of the persons taking part in the ceremony and the trustees of the chapel, a drawing of the proposed building, the Ilkeston Wesleyan Methodist Circuit Plan, plans of the two Nottingham Circuits, the Ripley Plan, and copies of various papers — The Watchman, The Methodist Recorder, the Ilkeston Pioneer and the Erewash Valley Telegraph. Soon thereafter the building of this new Wesleyan Chapel began, standing back from the main road to ensure quietness and privacy. This would be at the rear of the present Wilkinson store. Trueman’s History of Ilkeston (1880) refers to the chapel as “an ornamental structure, with a turret at the north-east corner. The windows and principal entrance door are circular-headed, and the building is altogether light and airy. Spacious rooms for the Sunday School are attached”. Before its completion in 1873 the Pioneer described it as “a neat commodious Chapel, 55 feet in length by 35 in width, with one end gallery for the choir; a school-room, with a spacious class-room for infant scholars; and two vestries for adult Bible classes”. The Wesleyan Methodist Chapel built on the site of the former Fletcher family factory, as it appeared in an 1877 poster. (courtesy of Ilkeston Reference Library). It is viewed here from its Bath Street side. The Sunday School room can be seen at the rear of the main building. 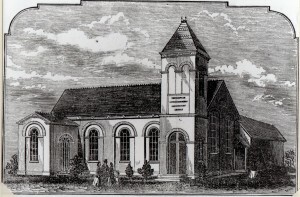 The first services at the Chapel were held in October 1873 when the opening was so popular that some prospective worshippers had to be turned away from the evening service, held in the chapel which seated about 500 people. 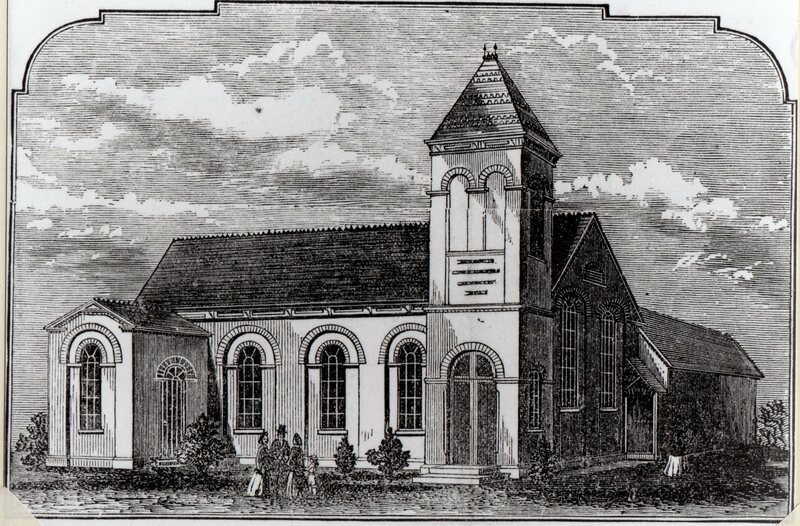 At this time the Pioneer quoted a total outlay of £1800 for the new premises, of which £1300 had already been raised – part of it from the sale of the previous Wesleyan Chapel in Market Street to the Methodist New Connexion. The rest would be raised from service collections, tea meetings, etc. Its final cost was £2,500. The chapel was constructed by Ilkeston builder Frederick Shaw of Bath Street and later, of Manor Farm, the son of lace mechanic William and Mary (nee Mather). He had married Marina Matilda Hawley, daughter of South Street butcher John and Mary (nee Burgin-Richardson) in 1855. And her oldest sister Ann Hawley was married to lacemaker Joseph Fletcher whose family had just vacated this site. In 1875 further land was purchased, adjacent to and in front of the chapel where some old houses stood …. for £375. And yet more land was similarly added in 1881. The original chapel eventually became the Sunday School rooms for a new Central Methodist Church, built at the front of the same site. The memorial stones for this new Church building were eventually laid in October 1896 and it was formally opened in March 1898. We are looking towards Bath Street, at the premises of Leeds and Leicester Boot Co. (46 Bath St.) and at the Queen’s Head Inn, now much closer to the road (48 Bath St.) . The new church of Gothic design, constructed of red bricks with terracotta and stone dressings at a cost of £5500, had a spire 120 feet above the street level and which caused some controversy at the time. William Smith writes that “some of our friends were a little doubtful about the spire, but there was a purpose in it and it was meant to show all around what was going on”. The same writer also records that many a traveller on the Erewash Valley line of the Midland Railway enquired what the spire was. One man, when asked was given the reply, “It‘s the new Wesleyan Chapel in Bath Street”. “No, tisn’t”, said a boy correcting him, “it’s the Wesleyan Church in Bath Street”. There was seating for 940 adults and it was then the largest church building in Ilkeston. It was closed in 1968 and its demolition started in 1971. Traffic warning. September 6th 1878. am. Henry Knighton, contractor and carter – and landlord of the Granby Arms in Cotmanhay Road – had just about managed to navigate his way up Bath Street from the Ilkeston Boiler Works in Rutland Street. Aided by his employees, he was on board his heavy dray, pulled by 11 horses and carrying a large boiler. But right at the top of the road he came to a halt. The horses could pull no further. Henry went for reinforcements — more horses – while his men tried to continue the journey. And that was their mistake!! The horses were overpowered, the boiler became detached and glided with the dray down the hill. Just below the Wesleyan Chapel it was stopped in its tracks by the shop front of widow Sarah Orchard (nee Whitfield), grocer and general dealer, causing considerable damage to the brickwork and crushing the windows on the second storey. Traffic warning. Thursday a.m. February 17th 1881. I hope Sarah had buildings insurance!! A horse and trap were being guided up Bath Street, just past the Primitive Methodist Chapel, when the animal slipped. Thinking that it was about to fall, the driver pulled on its reins and it lurched rightwards, onto the causeway and then straight into Sarah Orchard’s shop window – at number 29A – smashing both panes of glass. There were no injuries to humans or horse. The collar of the latter was found to be too small and it was suggested that it had had difficulty breathing as it staggered up the steep hill, causing its initial difficulties. A high bank with a garden on it. At this point was Spring Lane down which, on its right-hand side, was the Spring Cottage beerhouse. And now for the rest of the west side of Bath Street.